I spent the week before I visited Cambodia Mine Action Centre’s Demining Unit 6 operations site at Boeng Melea worrying about my blood type. I don’t know my blood type. And everyone seemed to think this was an essential piece of information for visiting a minefield. What I should have done was visit the children’s hospital in Siem Reap, donate some blood, and find out my blood type there (and get a free coca cola! ), but I ran out of time. Which is how I found myself standing in a cool grove of trees beside one of the unexcavated corners of the ancient Boeng Melea temple listening very carefully as the deminers explained the array of signage in front of me, hoping that I would not find myself in a situation where knowledge of my blood type was necessary. A white stake means the area is safe. 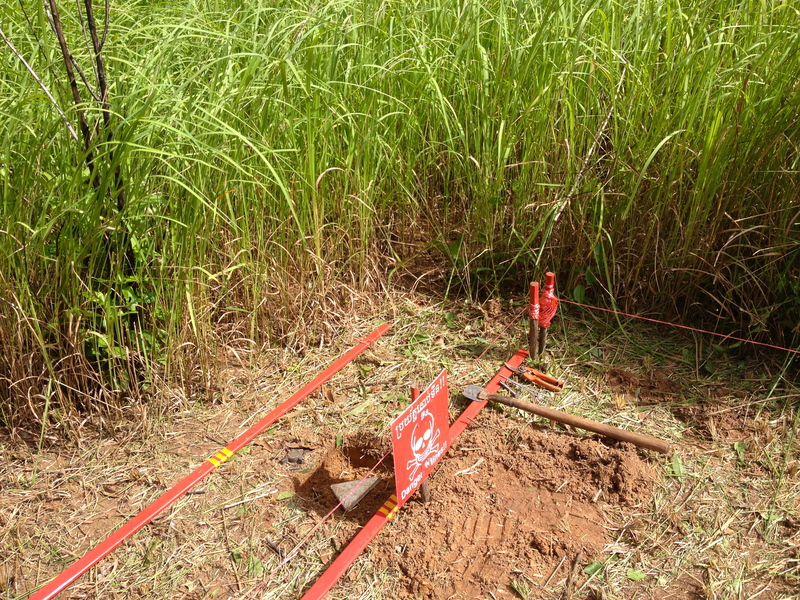 A yellow stake marks a landmine or other ERW to be neutralized, with a label describing it. A red stake means an uncleared area: a danger zone. Don’t walk past the red stakes. No problem. 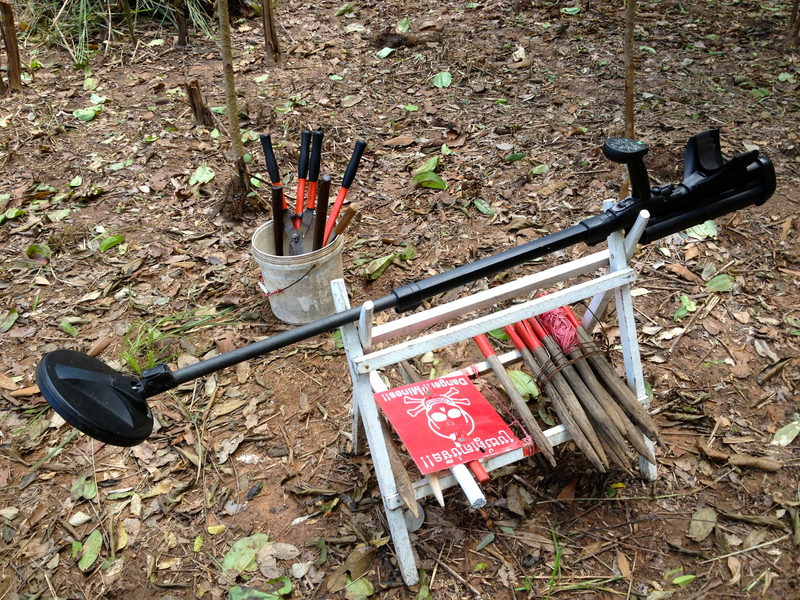 It’s easy to forget living in Siem Reap that explosive remnants of war are a very real threat. I go on Saturday morning bike rides with a group of expats most weekends, and part of me always has an eye on the undergrowth, to make sure that we’re not heading down an unused, and possibly dangerous path. I think I drive my friends crazy, with a constant refrain of don’t step off the path. But when I was doing research for our handbook on disability services, part of my examination included scrolling through the endless spreadsheet put out by CMVIS (Cambodia Mine/UXO Victim Information System) that documents every ERW/UXO accident in the country: who the victim was – what they were doing – where they were from – how old they were. Just hundreds and hundreds of names of people – of civilians – who were just going about their lives until one day the unthinkable happened. When you see a list like that – and you work with people every day who have lost a part of their lives to a mine or other ERW – you can’t help but think about the threat that’s around you all the time. Of course, I’ve never gone actively seeking out this threat. Until I found myself in DU6’s minefield. Under the quiet canopy, and satisfied I was following the explanation on the meaning of the various stakes, we walked across to the cache of discovered and neutralized ERW. For the month before the election in Cambodia, the government strictly forbade any explosions – this actually included fireworks (and made for a frustrating Canada Day/4th July) as well as any ERW found by demining operators throughout the country – so any ERW found in the weeks before were carefully placed in a pit between the tent housing what I’ll call the command centre, and the path to the minefield. I peered into the shallow hollows and looked at the various explosives nestled inside. 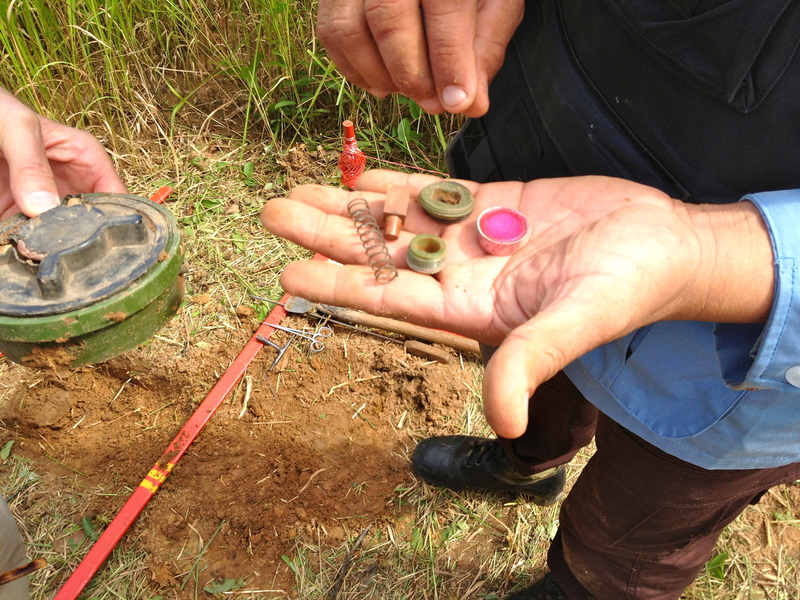 This one was a typical plastic mine, this other one a Chinese tripwire. 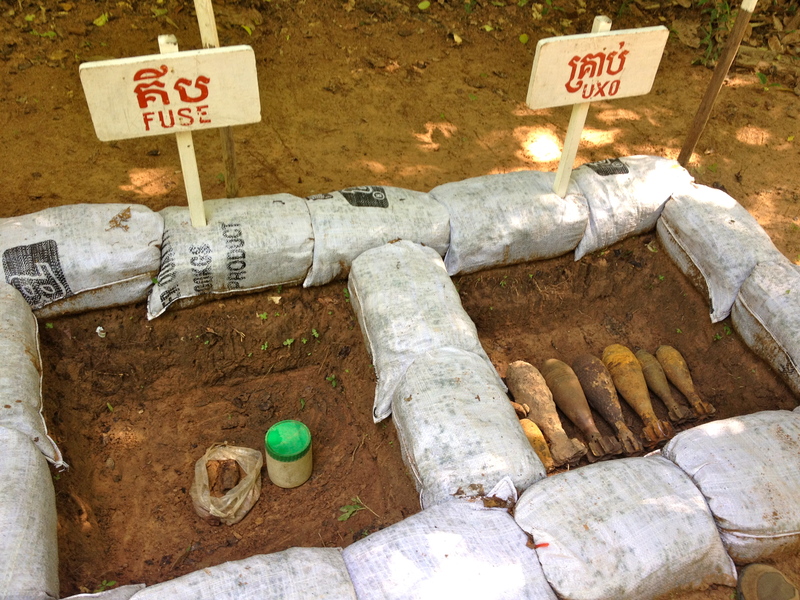 Pieces of other UXO, mostly unexploded artillery were stacked neatly in a separate hollow. As I leaned over to look in the small plastic container that held the fuses separate from the explosives, CMAC explained how they could still blow off your fingers even separated from the mines if they were jostled around too much. I casually took a small step back. After I’d been instructed on the various types of mines, most of which I am familiar with, but, when quizzed, I couldn’t entirely name (“You work in mine action!” I was admonished, though was vaguely redeemed when I could explain detonation), we walked down the small forest path to the minefield itself. Minefields to be cleared are chosen based on a direct request from a village that believes it is in danger – either because mines or other ERW have emerged from the earth as seasons change in the paddy fields, or because there is an accident. Villages can then prioritize their community based on these factors, and these inform all of the demining operators conducting clearance across the country. This particular minefield was different because it is on ground that the local authority hopes to incorporate back into the nearby temple (a tourist attraction), and so, clearance here has become a priority too. It is very quiet in a minefield. The only noises in the one we were visiting – which was about 12 hectares long – was of the grass cutter, clearing away the undergrowth, and a vague background buzz of insects and birds. Deminers work in teams of two with most organizations (including both CMAC and HALO Trust), spread out along the length of the field. Their first job is to measure the length of the area they are demining. These are usually about one meter wide and 15-20 meters long. They mark it with the red stakes, between which twine is stretched to mark the edge of the danger zone. While they clear the brush, they stand on the safe side – that’s why it’s only about a meter wide, it needs to accommodate the reach of the deminer. We stopped at the first strip being cordoned off. Once the area was sufficiently clear of foliage, the deminer tested his equipment. A small square surrounded by white stakes marked the testing ground, and he ran his metal detector over the area once, satisfied when it stayed silent, then inserted a small piece of metal in the empty ground and ran his detector over it again. This time the detector made a wailing sound: indicating the equipment was in order. He walked over to the first square meter of cleared ground and ran the detector over it. Almost immediately, it wailed. Something was in the ground. First, he used a heavily magnetized trowel and ran it over the same area. Within a moment, something was stuck to the bottom of the trowel: an old bullet casing from a machine gun. Harmless. He ran his detector over the area again. It wailed again. This time, the trowel doesn’t pick up anything, which meant the item below the surface might be a landmine. He used a triangular ceramic tile to mark the spot the detector indicated. Then, on hands and knees, and protected by a chest cover, face cover, and helmet, he quickly dug through the soft dirt beside the tile, straight down. If it was a landmine, this was the safest approach, as they are detonated by weight on top of them, and can instead be approached from the side. But within a moment, he could see it was safe: again, not a landmine, but a huge old chunk of shrapnel. I learned all of this within moments of walking into the minefield, and dotted along the edge of the forest I could see more teams working carefully to clear the area, cordon off strips with variously coloured stakes, and focus on testing and scanning with their detectors. As we walked along over the rough ground – the area we were walking in had been cleared in the weeks prior – CMAC pointed out various yellow stakes sticking out of the ground. That one marked an old Chinese tripwire. This one beside the tree is a piece of UXO. They still had to be neutralized and pulled out of the ground. All of the area I was walking in was only safe because the guys I was with had spent months making it so. This minefield was 12 hectares, and would be completed in a few weeks. Then, people will finally be able to walk safely through it again. As we neared the end of the cordoned area, a deminer waved us over to the long grass where he was working. He had just detected something. We watched as he dug beside the marked spot with his trowel, and then carefully cleared the earth on the side of the small pit he had dug to approach the tile-covered area from the side. Within moments we could see that it was, in fact, an anti-personnel landmine. It was time to back up. We took a few steps away from him (you can stay oddly close, the blast range isn’t more than a few meters for these small mines) and watched him move the mine from the side. It was about 5 inches across, dark green, with the familiar black pressure pad breaking through the top of the ground that would cause it to explode if anyone weighing more than about 40 or 50kg stepped on it. There are two fuses on it, one on the side, and one in the bottom. Both had to be pulled out before the mine could be considered neutralized, and safe to touch. The deminer worked quickly, it was only a minute or two before he stood up and walked over to us, the mine in one hand, and the fuses and springs in the other. There it was. Safely out of the ground. Later, he would transport all of the pieces carefully back to the entrance of the minefield to be deposited into the pit for destruction after the election. Normally any ERW found are destroyed immediately, to save from creating potential stockpiles. But in election season, the rules change. There was something quite thrilling to watch this patient, careful man pull an explosive out of the ground and take it apart to make it safe, to have the power to destroy it safely. I have only admiration for these guys, who know exactly the dangers they face in their job every day. 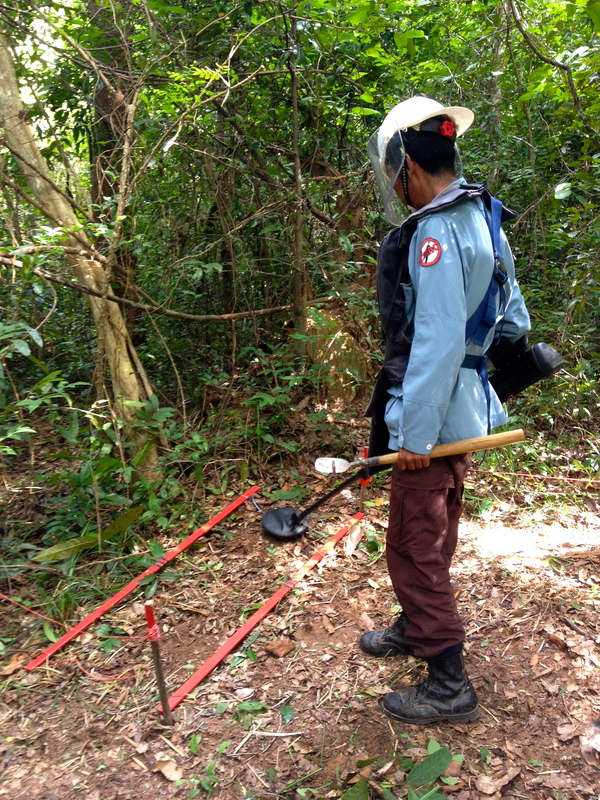 In addition to the civilian casualties Cambodia has every year, at least two deminers have died in accidents in 2013. One made a mistake in training and was killed. Another was transporting ERW for destruction in a vehicle and something went wrong, causing an explosion. And these guys are the very best at their jobs. It makes you realize how small of a chance civilians have when they encounter landmines. In the CMVIS spreadsheet I mentioned above, there is one line that describes the activity the victim was doing at the time of the accident. Too often, it says something along the lines of “transporting to village chief” or “trying to destroy.” Villagers live with the threat of AP mines (and other UXO and ERW) on a daily basis, leading some to believe that, if they come across something, the only option is to move it or destroy it immediately, not waiting to call HALO or CMAC or MAG. The reach of landmines laid 20 or 30 years ago is devastating, and in Cambodia, we see the consequences of them every day. Last week was the anniversary of the Convention on Cluster Munitions. I meant to write this before, but I ran out of time. I’m writing it now because I still think that understanding how mines work and how we get rid of them is important – and I think it’s so easy in places like Siem Reap to forget about them. We shouldn’t. We can’t. Cambodia has until 2019 to fulfill its Article 5 obligations of the Mine Ban Treaty regarding clearance of all contaminated land. Funding is decreasing, and there is a worrying rumour (that is actually not election related) that the United States is cutting all of its mine action funding to Cambodia. Don’t let that happen, because those guys on their hands and knees on the edge of a minefield are putting their lives in danger every day for the men and women and children and tourists who they will never meet. They think it’s important. I think it’s important. And so should you. Showing the neutralized mine with detached fuses. **Disclaimer: this post isn’t meant to be, you know, a guide to mine clearance. It only is a reflection of what I witnessed at this specific site.